The Old Royal Naval College is on the south bank of the River Thames facing north. 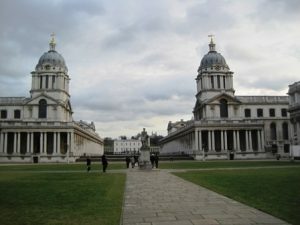 It is a part of the Maritime Greenwich World Heritage Site and was founded in 1694 as the Royal Hospital for Seamen at Greenwich. It was designed by Christopher Wren in two separate halves to protect the river view from the Queen’s House in Greenwich Park to the south. The site was converted to a college in 1892. The Pepys building in the west part of the site nearest to Cutty Sark station contains an exhibition of architecture and building techniques. There is also a roco chapel where free organ recitals take place and a Painted Hall which was originally designed as a dining hall but became a banquet room. The hall is decorated with murals by the artist James Thornhill who also painted the cupola of St Paul’s Cathedral. Admission to the college is free.